At Health on Earth Wellness, we take great pride in providing the finest chiropractic care to each and every patient. We have included information below about the different chiropractic services offered in our Crestwood chiropractic office, but please call us at 708.396.2500 if you have any questions! 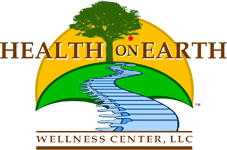 Welcome to Health on Earth Wellness Center! Here we will break down health, wellness, and fitness concepts that have been publicized to seem more complex than they really are. Our goal is to provide you with simple, common-sense tips to preventing disease and living a fuller, healthier lifestyle. We strive to offer only the best all-natural care in the world. We know we can help you make a positive difference in your life. Our philosophy is to deliver real, lasting results to get tot reconnected back to the source so you can Live Health on Earth. With multiple Doctors to better serve you. We provide advanced spinal correction and chiropractic adjustments utilizing "state of the art" chiropractic techniques. Never in the history of chiropractic care have chiropractors been able to provide the level of help and expertise that is available today. Many of the newest chiropractic techniques are actually safer, more comfortable and more effective than ever before. As a chiropractor who cares about utilizing the most advanced chiropractic techniques, has years of training, expertise and experience in helping patients get pain relief for back pain, neck pain, headaches, and other related conditions originating from the spine. Chiropractic care under a trained professional can even be used to prevent injuries and help you achieve total health or wellness. At Health on Earth Wellness, we teach our patients how to perform special "blueprint" exercises which can help strengthen and correct the irregularities in their body which may be causing pain or lack of function. Many of these corrective exercises can actually be performed in the comfort of your own home to help improve the effectiveness of your chiropractic care and spinal correction plan. In addition to skeletal misalignment, you may be experiencing pain that is caused by muscles and connective tissues which are out of their proper place. Other types of pain such as back pain, neck pain, and headaches are caused by muscles and tissues that are being used improperly, causing injuries over time. In each case, targeted corrective exercises and stretches from our experienced chiropractor will help you feel good while also helping your body achieve balance and health. What does nutrition have to do with chiropractic care? The goal of chiropractic care is to help patients achieve total health and balance with their body, and as part of that goal we provide specific recommendations on nutritional supplements and healthy food choices. Nutritional counseling by our experienced chiropractic health professionals can assist a patient on their return to optimal health. Do you know which supplements and vitamins are good for you? Do you know how these supplements and vitamins interact with one another? At our Tinley Park chiropractic clinic, we can provide each patient with a structured nutritional program that is based on their individual needs. The traditional explanation for acupuncture's effectiveness is that it modifies the flow of energy (known as qi or chi) throughout the body. Research published in the May 30, 2010 online edition of Nature Neuroscience demonstrated that the effects of acupuncture needling include influencing the activity of adenosine, an amino acid which becomes active in the skin after an injury to ease pain. This may explain in part why pain relief is often experienced as one of the benefits of acupuncture. In fact, much research in the West has focused on this pain-relieving effect, rather than acupuncture's traditional role of balancing energy to address a wide range of disorders, and the more subtle mechanisms that may be responsible for its overall benefits to health. Acupuncture was popularized in the States during the early 70's after President Nixon opened relations with China. At the time, a New York Times reporter, James Reston, had an appendectomy in a Chinese hospital using acupuncture as a means to decrease his post-surgical pain. At Health on Earth we support the goal of acupuncture in promoting and restore the balance of energy, which flows throughout the body, the benefits of acupuncture can extend to a wide variety of conditions, from emotional disorders (anxiety, depression) to digestive complaints (nausea, vomiting, irritable bowel syndrome). It can be beneficial for pain syndromes due to an injury or associated with chronic degenerative diseases such as rheumatoid arthritis. It can also be helpful in treating neurological problems like migraines or Parkinson's disease, or as a rehabilitation strategy for individuals who suffered a stroke. Respiratory conditions, including sinusitis and asthma have been relieved with acupuncture, as have many gynecologic disorders and infertility. Acupuncture has also proved beneficial for reducing fatigue and addictions, and for promoting overall well-being. There is a saying that an ounce of prevention is worth a pound of cure. Your spinal health is no exception. Posture and spinal screenings by a trained and experienced chiropractor like Dr. Frank Vaught can help reveal important health information, unlocking the door to improved health and well-being. In order to help the Crestwood and Chicagoland community, we provide screenings at area malls, community events, health fairs and places of employment. Contact us today at 708-396-2500 to arrange a screening at your event or workplace.